Another Impressive Performance By Bell's Award Winning Decathlon Team! Bell High School placed 2nd in its conference and 4th place overall, with 47,977.7 points among 55 high schools. Bell HS will again be competing at the State level in Sacramento for the seventh consecutive year. Congratulations to all the decathletes and their coaches, Heather Wilson and Mathew Moreno! 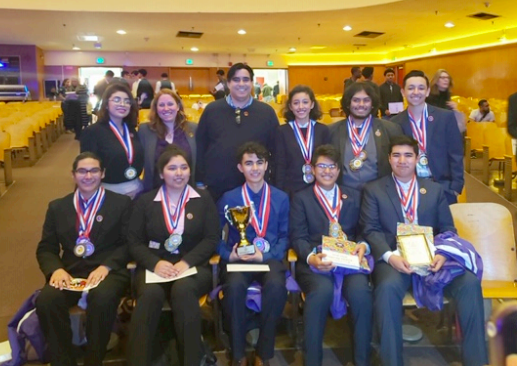 The top teams were announced on Sunday, February 10, 2019 at L.A. Unified 2019 Academic Decathlon awards ceremony, held at Hollywood High School. Hundreds of decathletes, representing 55 high school teams across the District, celebrated their achievements in the auditorium with family members, friends, teachers, principals, school staff and other supporters. Top-scoring students also were honored with individual medals and trophies for academic achievement. Bell High School placed 2nd in its conference and 4th place overall, with 47,977.7 points among 55 high schools. Bell HS will again be competing at the State level in Sacramento for the eighth consecutive year. Congratulations to all the decathletes and their coaches, Heather Wilson and Mathew Moreno! 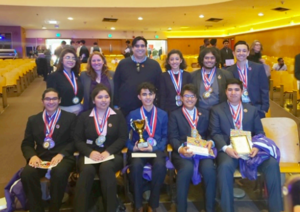 The top 10 teams will move ahead to the 2019 California Academic Decathlon competition, scheduled March 21-24, in Sacramento. Since 1987, L.A. Unified has won 20 state contests.